Every station on the Congress Line was almost exactly the same, except Kostner, which had one big difference: it was opened after the rest of the line. Kostner station was not part of the original plans for the Congress Line. Stations had been planned roughly every half mile east of Kedzie and spaced at approximately one mile intervals west of Kedzie where population densities were more diffuse. However, most stations had two entrances, spaced about a quarter miles apart, bringing a larger number of people within walking distance of a station entrance. Stations were planned at Pulaski and Cicero, with an auxiliary entrance at the west end of Pulaski at Keeler Avenue. On the adjacent Garfield Park Line that the Congress Line was replacing there had been two stations between Pulaski and Cicero: Kilbourn and Tripp. The Keeler entrance to Pulaski was reasonably close from where the Tripp station had been (about a half-block), but there really was no direct replacement for Kilbourn station (other than walking three blocks east or west to Keeler or Cicero, respectively). Residents wanted an intermediate station at Kostner Avenue -- exactly halfway between Pulaski Road and Cicero Avenue, although only two blocks from the Keeler entrance to Pulaski -- but city and CTA planners and engineers resisted. The wider spacing of the stations with the provision of multiple entrances was intentional on the part of the city and CTA , who designed the line to provide faster travel times with fewer stops. Now that the surface and rapid transit systems were unified under the CTA , close "L" station spacing to compete with surface lines became redundant. CTA planners preferred that passengers be "combination riders", as period advertising put it -- to use buses for local, short-haul trips and rapid transit for longer journeys. Wider station spacing and faster train speeds made this type of mode split more attractive. Local residents were not interested in CTA planners' broader goals of efficiency and system productivity and continued to press for an intermediate station. Community pressure led to the passage of a city council ordinance on July 26, 1955 requiring that an intermediate station be built, but the city Department of Public Works and the CTA dragged their feet on building the station. CTA's ridership projections showed that the station would never attract sufficient ridership to justify its construction. In addition, the station would require additional operating equipment and funding and discourage commuters living to the west of Kostner Avenue because of additional running times resulting from an added station stop. Residents tried to negotiate, saying they didn't demand an extravagant station and would settle merely for wooden boarding platforms with stairs up to the Kostner Avenue overpass. In reality, it's doubtful the city or CTA would have agreed to this, both due to operational issues such as fare control and due to a desire not to blemish the sheen of the system's new showpiece line with utilitarian wooden platforms. By spring 1960, local residents were losing patience and threatened a lawsuit against the Chicago Department of Public Works (under whose auspices the construction of the Congress Line actually fell). 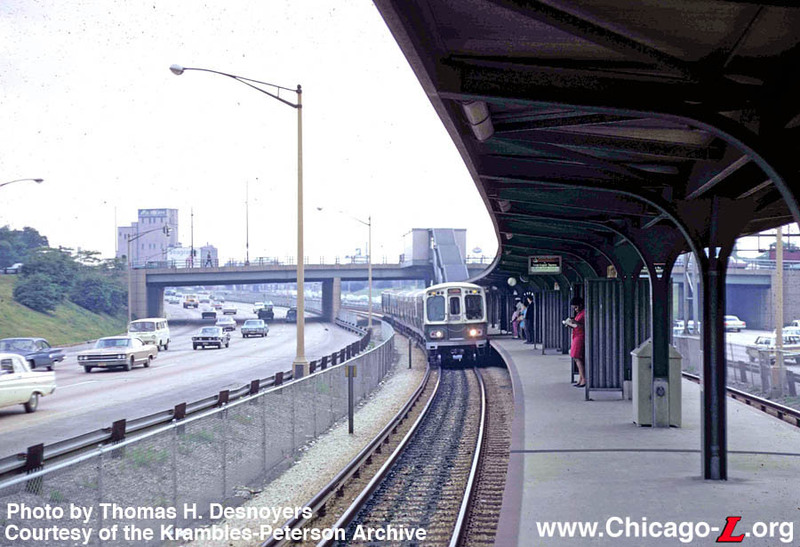 By 1961, the city and CTA capitulated and agreed to add a Kostner station. Construction of the station began in late 1961 and cost $750,000, funded by the City of Chicago. An intergovernmental agreement was signed between the city and the CTA whereby the CTA would perform track work and install signals and power distribution facilities and the city would build the station itself. Since the Congress Line was already in operation and needed to remain in operation while a new island platform was built between the tracks the CTA first built two temporary bypass, or "shoofly", tracks around the station site. The shoofly tracks were used from November 2, 1961 to July 8, 1962 while a contractor chosen by the city under a competitively bid contract constructed the station facility. The station was dedicated at a special ceremony held on August 3, 1962 attended by Mayor Richard J. Daley, Public Works Commissioner (and future CTA chairman) George L. DeMent, 30th Ward Alderman Daniel J. Ronan, and CTA Chairman Virgil E. Gunlock. The station opened to the public at 4:30am, Sunday, August 5, 1962. The Kostner station is nearly identical to every other station built on the Congress Line, including an island platform and a small station house on Kostner's overpass. The station house is smaller than most Congress stations, however, due to the relatively low patronage the Kostner station was expected to attract. Unlike the long, enclosed, sloping ramps that connected the station houses to the platforms at most Congress stations, Kostner instead had stairs. The Kostner station house, located on the east side of the Kostner Avenue expressway overpass, is 32 feet long and 17 feet wide (smaller than the 42 feet long and 21 feet wide typical Congress stations). Continuing the pattern of rotating decorative colors, the exterior walls were a combination of light gray blazed brick and structural glass blocks. The station's storefront-type entrance was constructed of aluminum panels, polished plate glass windows, and two aluminum framed plate glass doors with the signature Congress Line cast CTA logo door handles. The interior of the station house was finished in light gray glazed tile with modern florescent lighting. The smaller dimensions of the station house translated into much more modest fare controls than the other Congress stations. There was a one-position stainless steel agent's booth (as opposed to the two-position booths at other Congress stations), an agent-controlled turnstile, and one exit turnstile. There was no exit rotogate, no coin-operated turnstile (although there was space to install one later, if desired), and no complex system of rolling gates to close off the agent-controlled turnstile during periods of pay-on-train. The island platform is 600 feet long, typical of Congress Line stations. 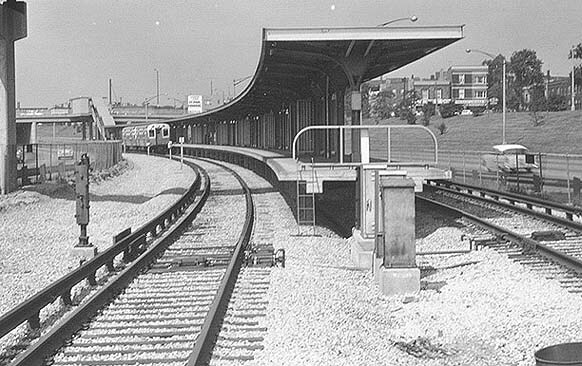 What is not typical of how severely curved Kostner's platform is, a result of the existing track profile that was never designed to accommodate a station platform. Line-of-sight for conductors was a problem at the station, aided mostly by the addition of a series of mirrors that allowed the conductors to see the entire side of the train consist. The platform was covered with a canopy for its entire length. The canopy is supported by a row of structural steel columns that split into gently curving angled to support the canopy roof. Eight windbreaks, each 15 feet long and six feet high, were spaced along the platform to provide additional shelter. Clay tiles were inlaid along the platform edge to emphasize it for safety purposes. 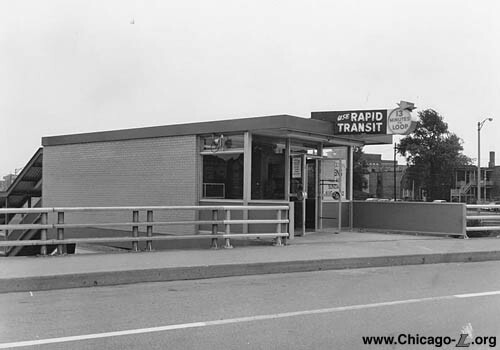 The insufficient demand for the Kostner station quickly became evident, earning Kostner a place among the shortest-lived of Chicago rapid transit stations. The station's annual ridership never reached more than just over 258,000, achieved in 1967. Thereafter, ridership began to decline, falling off to 137,791 -- just over half its all-time ridership high -- in 1972, its last full year of operation. When CTA began facing severe financial hardship in the early 1970s, Kostner became an easy choice to close for economization. Kostner station closed Sunday, September 2, 1973, in the same service revision that closed California and Central on the Congress Line, Dorchester on the Jackson Park branch, State/Van Buren in the Loop, State/59th on the Englewood branch, and Isabella on the Evanston Line. Today, the Kostner station sits abandoned, its station house entrance secured with a plywood covering and high chainlink fencing.